Over the past few years, there has been an increased interest from the environmental community to reduce livestock grazing on public lands. This has made it increasingly important for livestock producers to establish baseline data and to collect credible monitoring data on grazing lands to defend decisions intended to keep grazing on the land. The Wyoming Department of Agriculture (WDA) provides funding help for on-the-ground rangeland health assessment projects. WCCD will sponsor these projects for our local Ag producers and encourage them to first visit WDA's Rangeland Health Assessment Program on their website, to better understand the program and to download the application, support documents, and the criteria score sheets by which each application will be scored. Many agricultural based organizations are involved in the development of the Rangeland Health Assessment Program (RHAP) and believe that cooperative rangeland monitoring is an important tool to help stabilize livestock grazing on lands administered by federal and state agencies. The intent is for management decisions to be based upon the evaluation of monitoring data, but sometimes lack of time, lack of funds, and lack of staff hinder consistent monitoring. Collaboration between those directly impacted insures the collection of credible data and management decisions are less likely to be litigated. Gooseberry Revegetation Project - More Information Coming Soon! 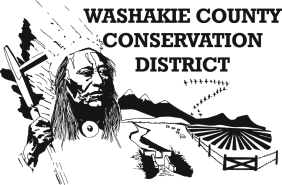 The Washakie County Conservation District (WCCD) provides the technical assistance for the irrigation program, which includes measuring flow using the Ultrasonic Flow Meter, Soil Moisture Sensor technology, and providing information to the public about different types of irrigation water management. Also available are the following booklets and flyers: Irrigators Growers Guide – Irrigation System Preventative Maintenance – Conservation Tillage Practices. Irrigation is no different from any other crop production input; to be managed effectively and economically it must be measured accurately. Several devices exist to measure water flow in pipelines. A relatively new alternative is the Ultrasonic Flow Meter (USFM). The USFM is a non-invasive device that can be used to measure both flow rate and volume. The USFM has clamp-on transducers, which eliminate in-line installation, allowing one meter to be used at many locations. The exterior meter can be installed without flow interruptions, with zero pressure drops and also insures leak free measurements that can be associated with in-line meter installation. The transmission, or transit-time, ultrasonic flow meter operates on the principle of phase shift. Two transducers act alternately as transmitter and receiver as two paths of sonic beams travel back and forth across the pipe. One beam travels downstream while the other moves upstream. The motion of the fluid causes a frequency shift in both waves. This shift is related to the velocity of the fluid. Research has shown that, when installed properly, USFM accuracy ranges from +/- 1 to +/- 5 percent of full scale. The WCCD has an Ultrasonic Flow Meter for use with the local NRCS Soil Conservationist by appointment. This meter is used to help agriculture producers in testing well output, pump flows, pipe flows, and rating the efficiency of irrigation systems.